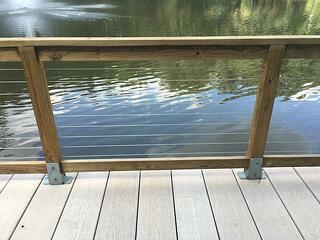 One unique design feature of the boardwalk itself is the railing. 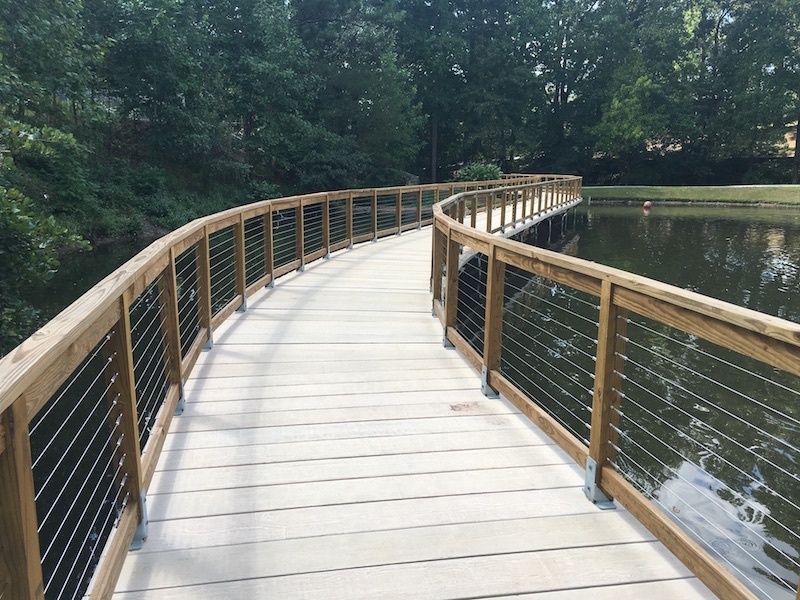 Unlike any other PermaTrak boardwalk railing to date, timber post uprights encase stainless steel cable strands along both sides of the entire Adam’s Park lake boardwalk, creating a mixed-material modern look. 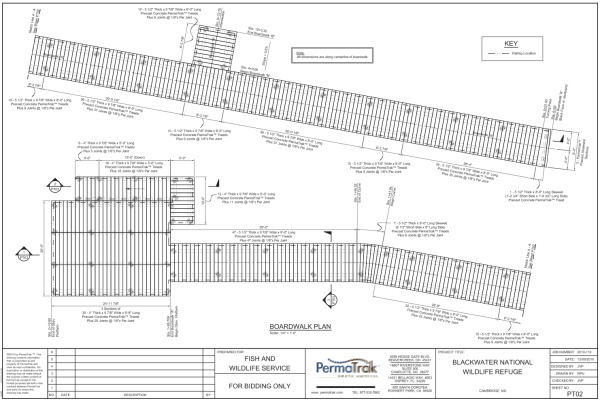 The trail leading up to the boardwalk is made of cast-in-place concrete and crushed stone. 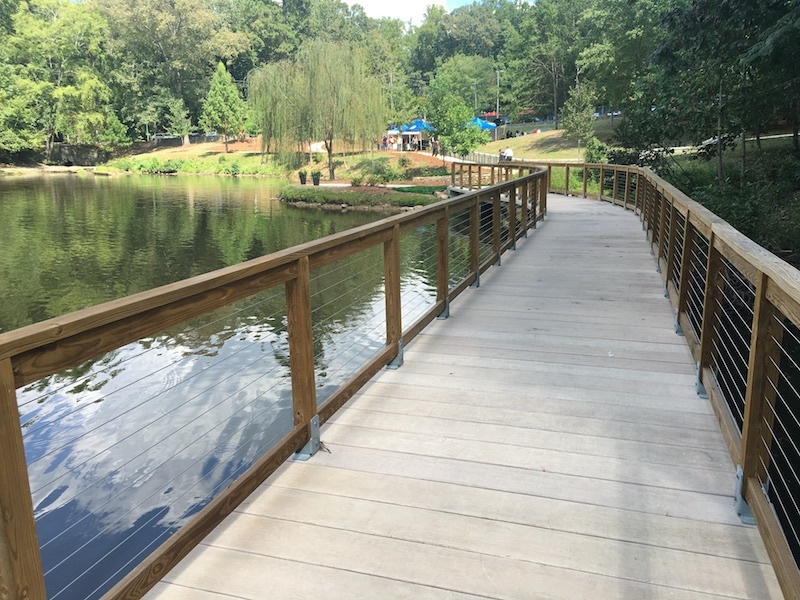 Park Pride, as a partner to the City of Atlanta, managed the project and raised the money from private sources for implementation. 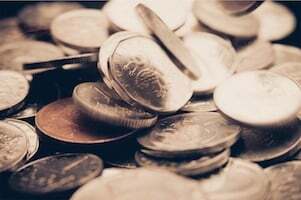 Donations from an anonymous principal donor, a Legacy Grant from Park Pride, and grants from a local garden club all contributed to the effort. 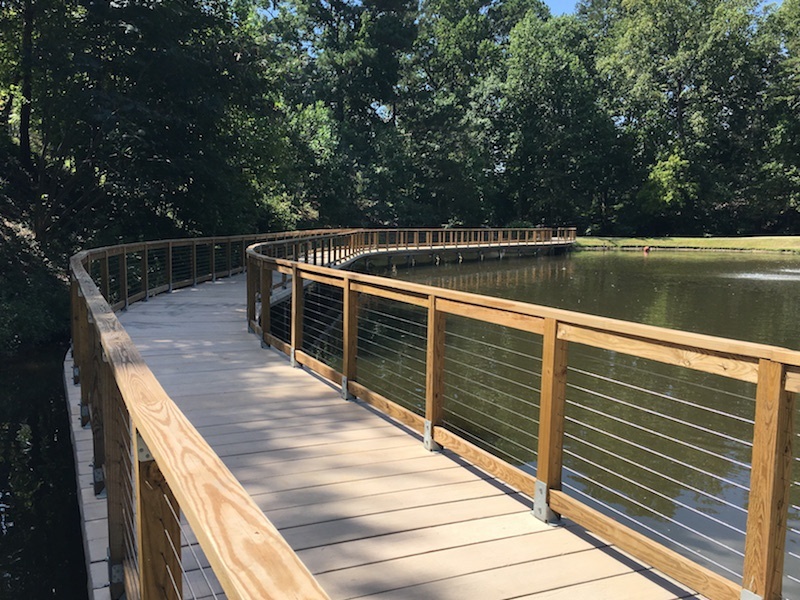 Ed Castro Landscape in Atlanta served as the project manager and Nature Bridges of Tallahassee affixed the boardwalk on helical piers via top down construction. The community first planned for the park’s restoration efforts during the 2008 park visioning process. The park’s path previously only extended about halfway around the lake. The city and community wanted more connectivity throughout Adams Park – to be able to walk, bike or run around the entire sizeable lake in the middle of the park. “People walking their dogs couldn’t experience the lake from a full 360 degrees. They had to climb a set of stairs and walk away from the lake to rejoin the path. It was disconnected. 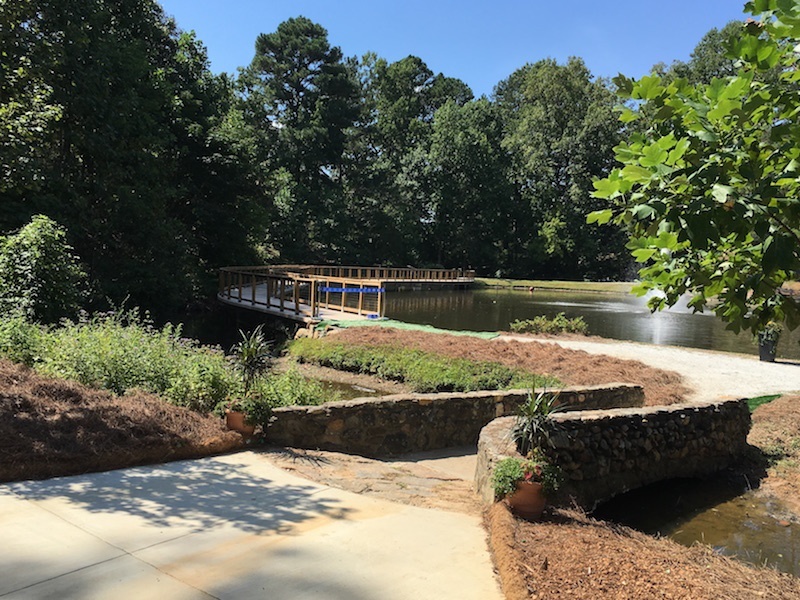 The community wanted a more navigable solution – access to walk around the lake without leaving it,” said Andrew White, PLA, Director of Park Visioning at Park Pride in Atlanta. Designers initially considered cutting into the steep and heavily vegetated lake shore to build a seawall edge and crushed stone path to complete the walking circuit around the lake. However, that plan was dismissed as having too great of an environmental impact to the water's vegetated buffer and to the lake, which feeds into the federally protected Utoy Creek. 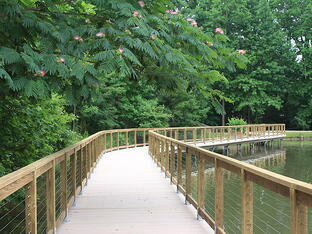 Once designers decided on a boardwalk solution over the lake, a boardwalk material evaluation took place. 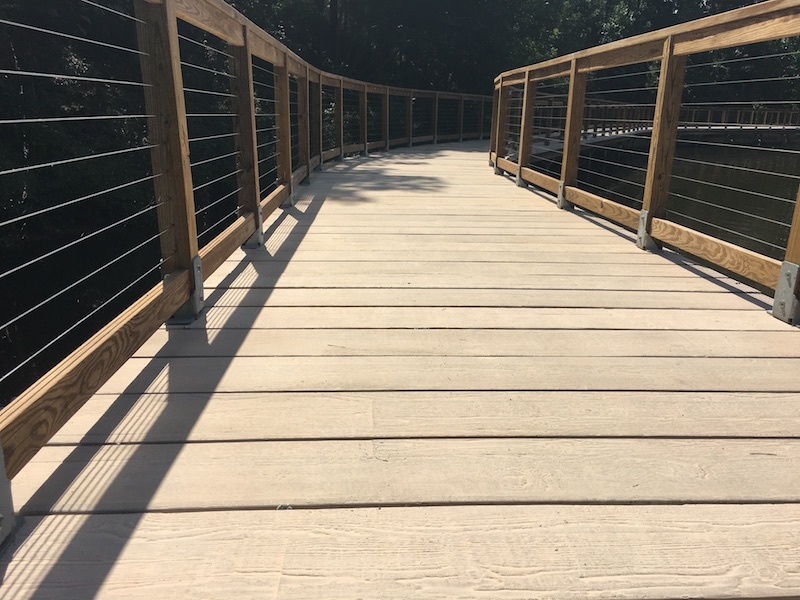 While a wooden boardwalk was considered, the significant cost of maintenance associated with wood made PermaTrak’s durable and maintenance-free concrete boardwalk the most fitting solution for Adam’s Park. 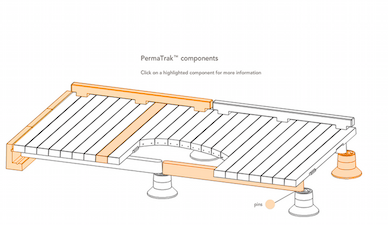 “It’s a great solution – especially for parks in big cities like Atlanta – the material needs to be almost bulletproof in terms of being easy to maintain and sustainable long term,” White adds. 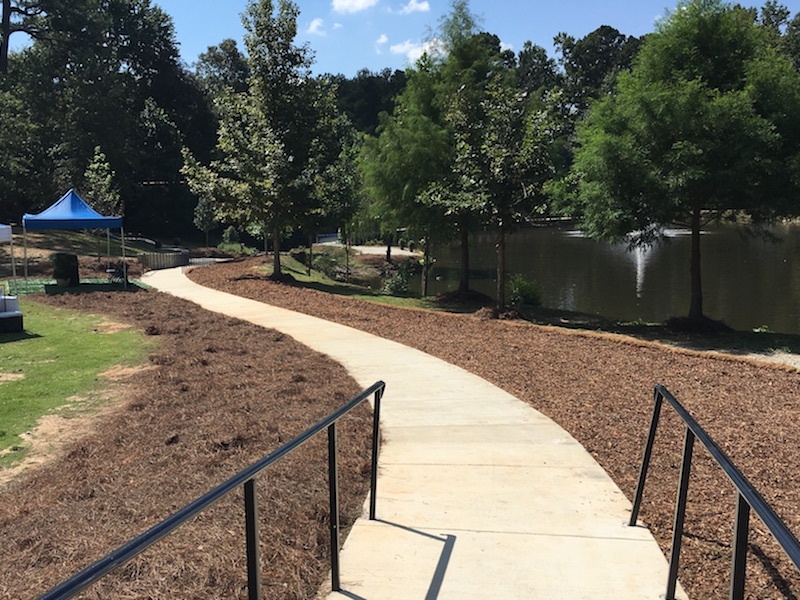 The Adams Park boardwalk ribbon cutting ceremony was held on September 2, 2016, The event speakers included: Atlanta Council Member, Keisha Lance Bottoms, City of Atlanta Commissioner of Parks & Recreation, Amy Phuong, and Park Pride's Executive Director, Michael Halicki. The ceremony also included many excited community members, some representing the Adams Park Foundation. Adams Park was designed by one of Atlanta’s esteemed landscape architects during the time of The New Deal: William L. Monroe, Sr. Known for his use of stonework, streams, and rock gardens in natural settings, Monroe was praised for his role in highlighting the area’s natural beauty: hilly topography, ample green space, and mature pine and hardwood trees. Adams Park's hardscape includes quite a bit of impressive historic stone work with natural stone walls, exposed granite and rock culverts. Over the last 80+ years, the park has seen dramatic change. 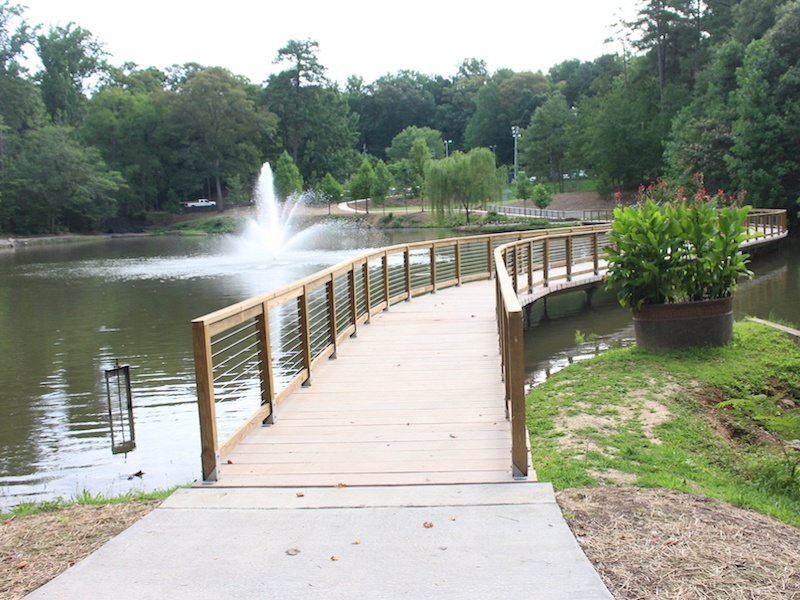 The park’s impressive list of amenities include a swimming pool, a new splash pad (opened in June 2016) tennis courts, a playground, two ball fields, a rec center, a golf course, a picnic area, and a large open green space with a fire pit, and now, the PermaTrak boardwalk. The most note-worthy facet of the park? “The Adams park community. From neighbors to folks on the ground maintenance crew,” White says. Citizens have enjoyed this park for decades and its meaning lies in the memories people have made at the park. 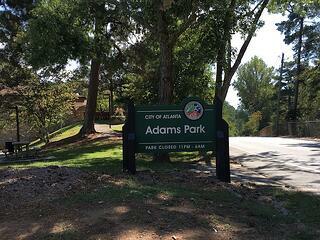 Earlier this year, Atlanta Mayor, Kisim Reed shared his admiration for the evolution of Adam’s Park. 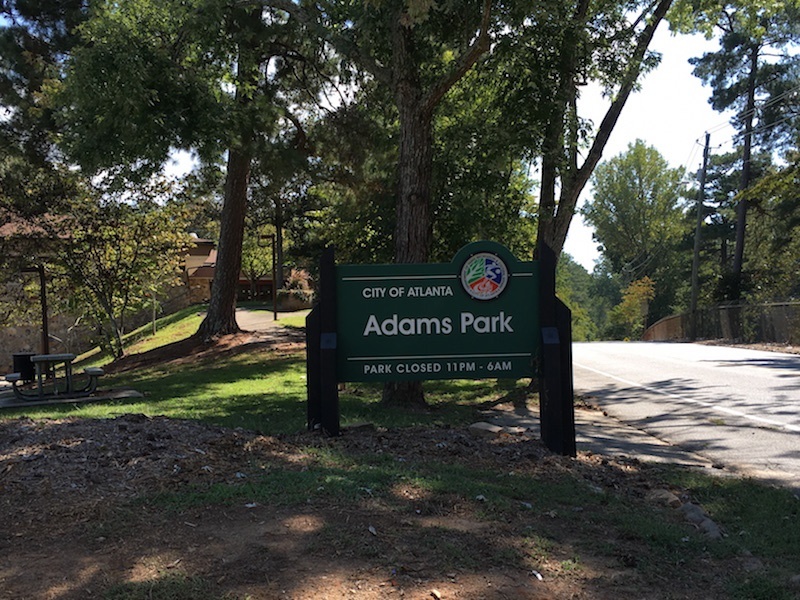 “I am pleased to say that Adams Park right now is better than the Adams Park when I was growing up…” With something for citizens of all ages to enjoy, Adams Park will continue to be a cherished fixture for Georgia residents.